This is a subversive book. It won't lead you to social or political revolt, but it will suggest overthrowing all of your current ideas about psychotherapy, personal growth and self-help. In the process, it will cause you to re-evaluate almost all of the therapies, techniques and books about self-help which are already out there. How does it do this? 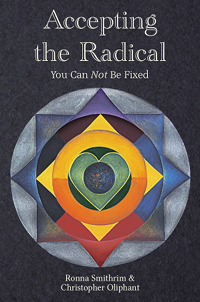 By teaching Radical Acceptance - an approach so radically different, and so radically powerful, that the challenging becomes inevitable. What makes Radical Acceptance so different is that your 'fixer' is powerless: no matter how hard you try, you can never fix yourself. "I've changed! I'm not the person I used to be!" "I can change! I just have to try harder!" "If I stop trying to change, my life will fall apart." "If I don't fix myself, no one will love me!" Put aside your fixer, as he or she isn't useful. Instead, begin to see your life from a whole new light: the light of Radical Acceptance.